At the conclusion of our last report I was still convalescing in London while Anne was in the process of bringing 'Sofia' south from New England. Sofia had reached Cape May NJ by early October, and after a brief stopover there headed up the Delaware River and through the Chesapeake and Delaware Canal to the Chesapeake. Once in the Chesapeake there was sufficient time for a brief exploration of the Eastern Shore calling in at St Michaels and Oxford before heading to Annapolis for a crew change. Here the Port Officer Westbrook Murphy insisted on having Sofia stay on his private dock while Anne arranged her crew change and sorted out various issues on the yacht. Westbrook and his charming wife Cindy could not have been more helpful and hospitable hosts. Such was their generous hospitality Anne said that it was very hard to leave! However, once OCC member Eve Wilhite arrived to crew Sofia for the next stage, they set off down the Chesapeake in blustery and increasingly cold conditions. Following brief stopovers in Deal Bay and Reedsville they arrived in Norfolk to a warm welcome from Port Officers Gary Naigle and Greta Gustafson on their refurbished private dock complex. At this point Anne decided to remain in Norfolk for a week in order to assist Eve with repainting the deck of her yacht Auntie, which was located in nearby Hampton Roads. As with our passage north Gary was very helpful in providing transport which included taking Anne round to Eve’s yacht in Hampton Roads. With Auntie’s deck repainted it was time for Sofia to head south round Cape Hatteras to Beaufort with a short stopover in the anchorage behind Cape Lookout before proceeding to Beaufort. Here the Port Officer Diane Tetrault had arranged a berth for Sofia in Homer Smith Docks and Marina for three months starting at the beginning on November. She could not have been more helpful; providing transport and generous hospitality - in sum a typically warm southern welcome! With Sofia now safely docked in Beaufort I was able to rejoin Anne to continue my physiotherapy in the USA. We were very fortunate that old OCC friends Ed and Sue Kelly generously made their home in New Bern, NC, which is one hour inland from Beaufort, as well as their car available while my recuperation continued. 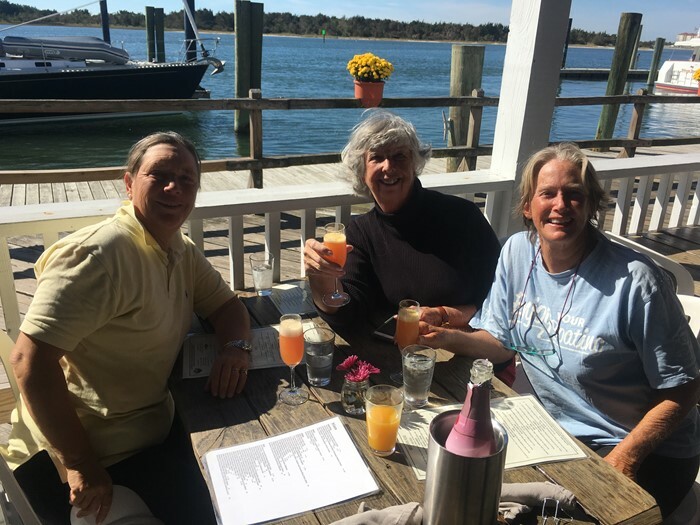 While here Anne was able to make significant inroads into Sofia’s job list as well as assist Ed and Sue with repairs to their catamaran Angel Louise, which had hit a log when transiting the ICW while returning from Maine to New Bern; it caused significant damage to the port propeller shaft, propeller and P bracket. Following Christmas and the New Year with our children in the South of France, we are now back in Beaufort getting Sofia ready to head south to warmer climes via Charleston and Savannah. We then plan to spend the spring cruising Cuba and the Bahamas.